We celebrated a big birthday this week! My daughter turned 4! Wow! My baby is fast on her way to becoming a little lady! We threw a "big" party for her this year and invited about 10 friends over for a pool party. 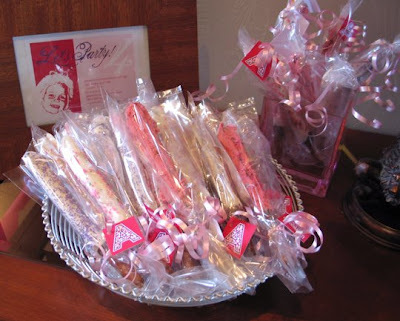 We decided to dip pretzels for favors. I'll tell you about our experience -- maybe you've been wanting to try these for yourself, too! I bought two bags - about 50 pretzels. I wanted to give at least one per child and mom, plus extra to send home to siblings and dads. 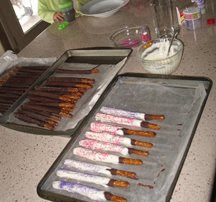 :-) First I dipped the pretzels in dark chocolate, then layed on wax paper to firm up. Then I dipped them in white chocolate - working fast so as to not "remelt" the dark chocolate underneath. Right after the dip in the white chocolate my daughter and I sprinkled them with assorted pink and purple sprinkles on all sides. I also did a few in pink with sprinkles - remember to have the color paste and not liquid color or the white chocolate will seize up. Jeanne,you are amazing! I would never think of something like this. I think I need to come visit you more often to get some inspiration. Oh, I forgot to wish your daughter a Happy Birthday!!!! They turned out so pretty ~ perfect for a sweet little girl's birthday! Thanks for posting. Very fun- and so yummy looking! The invitation in the background is so fun too! This is absolutely beautiful! I'll have to try it for our next gathering. I ate the pink one and Gramps ate the colored sprinkles one. Yummy. Yum! My mom does this for Christmas every year! We do these every Christmas with caramel first then dark chocolate. Oh. My. Word. The yummy doesn't stop. Oooooh! Caramel! That sounds good! I think I'll have to give that a try! Happy belated birthday! 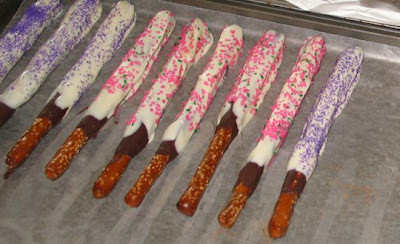 Dipping pretzels are a definite favorite!! I love these! We do them at Christmas for little gifts. 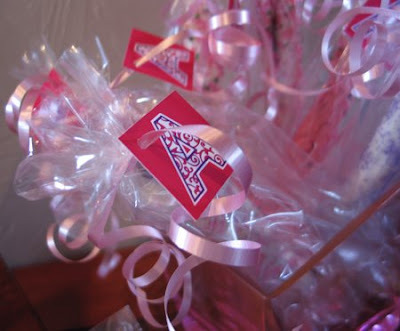 What a great party favor! Stopping by from Tip Junkie. Where do you find the pretzels? I've looked in my grocery store and haven't seen the fat sticks before. Thanks, Sarah! I found the pretzels at Target! The kids loved them!